Any Nebraska licensed or "legally exempt home" is eligible for the USDA Child and Adult Care Food Program (CACFP) with Midwest. However, let's make a few assumptions and show you how much you would be reimbursed. In this scenario, a Tier I family child care provider would receive an estimated monthly reimbursement of $ 680 per month. You must be willing to serve and document meals that meet the USDA requirements. This is not difficult and doesn't include anything fancy. Midwest will provide you with a free software program that cuts your paperwork in half. Therefore you should have access to a computer and the Internet. 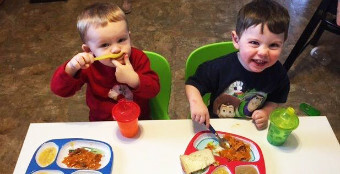 You should contact Midwest Child Care Association and our friendly Area Representative will come to your home and visit with you about the food program and provide you with all of the instructions you will need to get started. Check Release & Food Reimbursement Rates Here.